South Boulder Creek Action Group - A neighborhood group that advocates for the safety of people whose lives and property are threatened when floodwaters from South Boulder Creek overtop U.S. 36 in Boulder, Colorado. Do you have a safety plan in place for when our neighborhood floods? In many parts of the City, when there’s an official flood warning the instruction is to move uphill. For those of in and near the Frasier Meadows neighborhood in Southeast Boulder, that may not be a realistic option due to road closures and individual mobility issues. Join us at a Flood Preparedness Meeting next Monday, July 9th, 2018 to receive information about your specific flood situation from Boulder’s Office of Emergency Management (OEM). • View maps that show the progression of what areas are likely to flood first in our neighborhood so you can get a better sense of what your best evacuation options are. 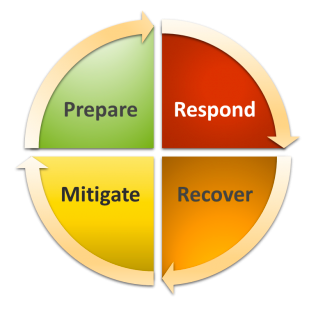 • Understand how to “shelter in place” if you can’t evacuate safely. • Get feedback from City staff about what the best option for you and your family may be. • Receive background info and resources so you don’t lose sleep every time it rains. This entry was posted in Uncategorized on July 3, 2018 by Tyler. 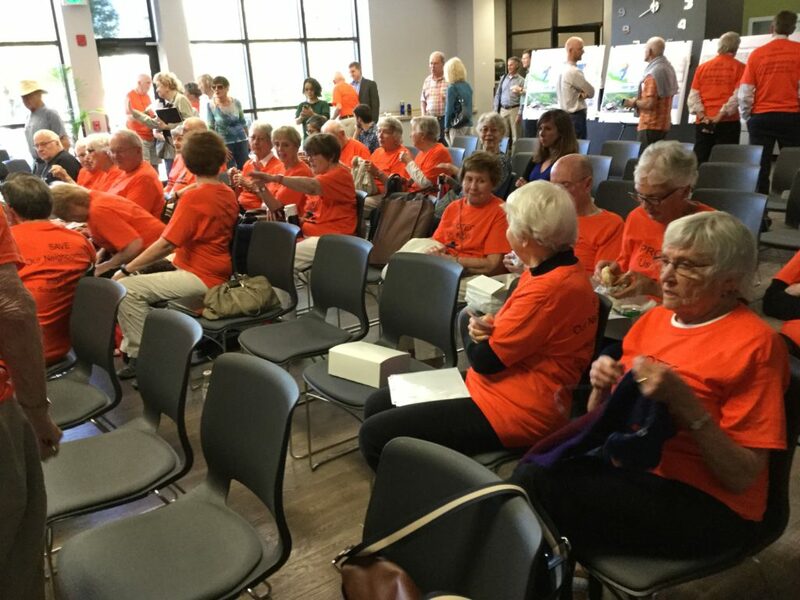 Flood mitigation supporters from Frasier Meadows Retirement Community wore orange t-shirts to support flood mitigation at last week’s joint OSBT/WRAB meeting in Boulder, Colorado, Monday, June 25th, 2018. If you joined the cohort who wore orange t-shirts to support flood mitigation at last Monday’s Joint Board Meeting OSBT/WRAB, thank you! You made a difference by showing up whether you signed up to speak or not. If you couldn’t make it, no worries! More opportunities coming soon. Here’s a brief summary of what went down. 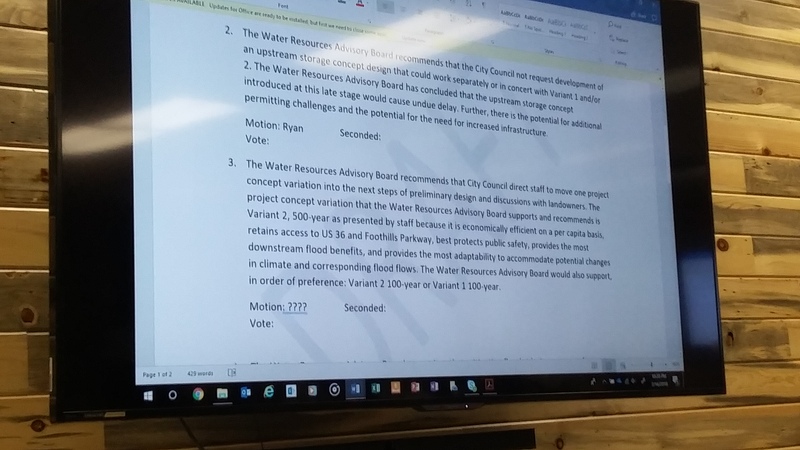 • The purpose of Monday’s meeting was for members of Boulder’s Open Space Board of Trustees (OSBT) and Water Resources Advisory Board (WRAB) to sit down together to hear staff’s updated proposals for flood mitigation on South Boulder Creek, ask questions, and have a joint discussion about next steps. • Yay for the Orange Wave! Approximately three dozen people from Frasier Meadows Retirement Community and South Boulder Creek Action Group arrived wearing orange t-shirts which made a big, exuberant statement of unity and support for flood mitigation. • On July 11, 2018: OSBT members will consider a motion to recommend any project concept variations they view as acceptable. Check out the concept variations for South Boulder Creek flood mitigation. Public testimony accepted at this meeting. • On July 16, 2018: WRAB will consider a motion to recommend a concept to move into the next steps of preliminary engineering. [WRAB may choose to rank its first choice, second choice, etc.] Public testimony accepted at this meeting. 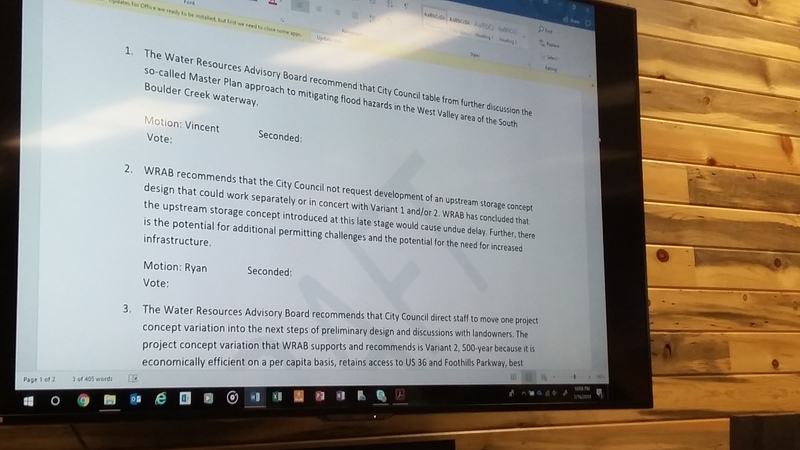 • On August 7th, 2018: City Council will consider a motion to recommend a South Boulder Creek flood mitigation concept variation to move forward into the next steps of preliminary engineering and property owner negotiations. We’ll be in touch again as each hearing date approaches. In the meantime, enjoy the 4th! Save these dates! The City has scheduled THREE public hearings re: South Boulder Creek Flood Mitigation at OSBT and WRAB this summer. The first is happening this Monday. Here are the details for all three. 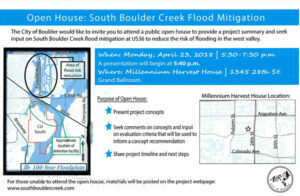 Public comment about flood mitigation at South Boulder Creek will be taken at each of these meetings. Attend and speak! If you’re uncomfortable speaking attend to get information and support your neighbors who are. This entry was posted in Uncategorized on June 21, 2018 by Tyler. 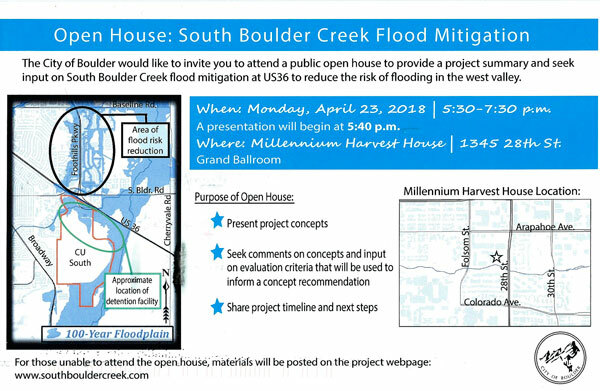 This Thursday, June 7th the City of Boulder’s Department of Public Works is hosting an open house about South Boulder Creek Flood Mitigation. View the new project design configurations! See results of the questionnaire that was available at the last open house. Comment on the evaluation criteria decision makers will use to choose a design. We wholeheartedly encourage you to attend this meeting and fill out a comment card while you’re there. Remind decision makers we are still at risk and ask them to prioritize expediency as they evaluate a number of options to protect us from flash flooding caused by South Boulder Creek overtopping U.S. 36. Attend to make your voice heard! This entry was posted in Uncategorized on June 4, 2018 by Tyler. Boulder Valley Comprehensive Plan Passes Four-Body Review! We are happy to share some good news with you! Updates to the Boulder Valley Comprehensive Plan including CU South recently passed a legislative process called four-body review. 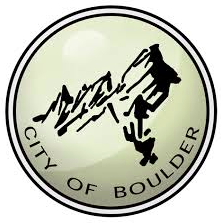 Four legislative bodies – City of Boulder Planning Board, City Council, Boulder County Planning Commission and Board of County Commissioners – all voted to approve amendments to Boulder’s long-range planning document. This will pave the way for flood mitigation to move forward. It has been a very long road and we wanted to thank everyone for their efforts and perseverance! While these four affirmative votes will allow things to move forward, the City and CU still have work to do regarding annexation negotiations. I’m sure we’ll hear more about this as things begin to unfold. We know the City wants to hear from the public on what’s important to them in such an agreement with CU (e.g., flood mitigation, housing, transportation, etc.). But, for now, let’s just give ourselves a chance to exhale. We have a lot to be proud of, not the least of which is the focused, rational and professional way in which we approached this issue with decision-making bodies and other members of the public. Kudos to everyone for a job extremely well done! Here’s a link to watch the full meeting of Boulder County’s Board of Commissioners who voted last Wednesday, July 26th. And a clip of the final vote (from the POV of one of our members) below. This entry was posted in Uncategorized on July 31, 2017 by Tyler.